The easiest way to let go is to never equate events, actions and people to money. Money is important. No doubt. But you don’t necessarily need to have money to live intelligently! When you lose your job, fear grips you. Why? Not because you are incompetent and worthless. But because you are worried about the lack of a revenue source in the present moment and perhaps in the immediate future! The more you cling on to that job, which you already have lost, the more difficulty you will have moving on and moving forward. It could be a job, a position, a lover, a title, a piece of land….whatever you have lost…..the same principle applies. Why do you need a position in society? So that your stature can attract career and professional/business opportunities. Why? So that you can earn more money. Now, what if this position is taken away? You can still earn money through some other means. But you want to cling on to what is already lost because you are thinking scarcity __ of what isn’t, instead of thinking abundance, of what is possible with a fresh start! Money and all the conditioning related to money, from the time you are born, has led you to hide behind money’s façade of security. Money can surely buy you things. But it can’t buy you inner peace or love or a Life. So, if you are agonizing over letting go of something (or even everything), because all you want is to live in peace, in love and be blissful, then stop thinking about money. Your decision to let go will then be easier to make. 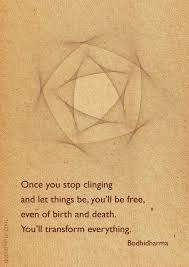 When you let go, you are free, unfettered and are ready to go where you want and where nobody ever has! Our current is this Life. It is constantly offering to take us to where we have never gone before. But we are not willing to let go; we are clinging on our deeply conditioned sense of ‘financial’ security. It is because we cling on to money or sources of money, that we find our lives listless, monotonous and boring. This is why we are unhappy. The truth is that only when we let go and move on will we see newer horizons. Remember too that our true work is the journey of Life, of moving on, of living, and not of clinging on to what we perceive as ‘safe and secure’ pastures!